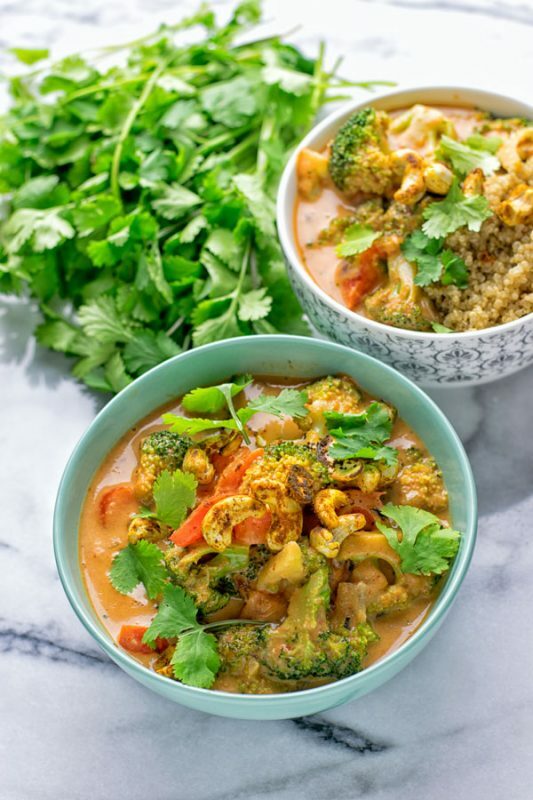 This Cashew Curry Broccoli Stir Fry is amazingly rich, satisfying, and full of incredible flavors. Made from entirely vegan and gluten free ingredients, this is an easy one-pot meal you don’t want to miss. Currys are often my way to go. Many of you have already enjoyed my Lentil Chickpea Yellow Curry, which is a great favorite of many people and getting rave reviews. But sometimes I also crave curry flavors in different combinations such as in this fast Thai Green Curry Mango Chickpea Dip. What I love most about curry is the fact that you can put basically everything you want to add to it together in one pot and cook it that way. You already know of my fondness for one pot meals. Just think about gorgeous bowls like my Vegetarian Fajita Pasta or the One Pot Pad Thai Noodles. So easy and good! 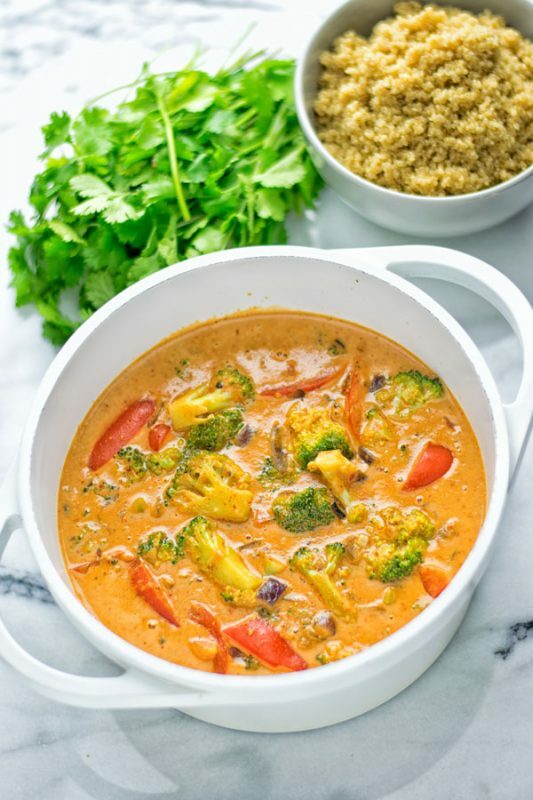 I hope you come on board with me to experience this Cashew Curry Broccoli Stir Fry. 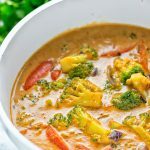 it’s hearty, creamy, addictive, fresh, tasty, super easy, rich, versatile, mouthwatering, and a must make in your kitchen. What is a stir fry? I know some of you are cooking buffs and this will not even be a question for you. But for others, especially beginners in cooking, this might actually be something that is not totally clear. So here it comes, and it is not really surprising. A stir fry is always fried (as you could have guessed from the name). Traditionally, it is made with fish or meat, and combined with veggies. It’s a super versatile dish because you can adjust it very much to your taste by including your favorite ingredients. Technically, it is also very easy to make. You can do this in a wok or even a standard frying pan or sauce pan. We will doing everything in one pot, so there is in general no need for a wok or special equipment. Big plus! First, heat a bit oil (coconut or olive oil will work) or simply use vegetable broth if you want cooking without added oil. Add the diced onions and garlic to the oil and fry for around 3 minutes on medium high heat. Give the broccoli florets to this mix and fry for an additional 5 minutes. Keep stirring so that the vegetables don’t burn and get fried uniformly. Reduce heat, if necessary. 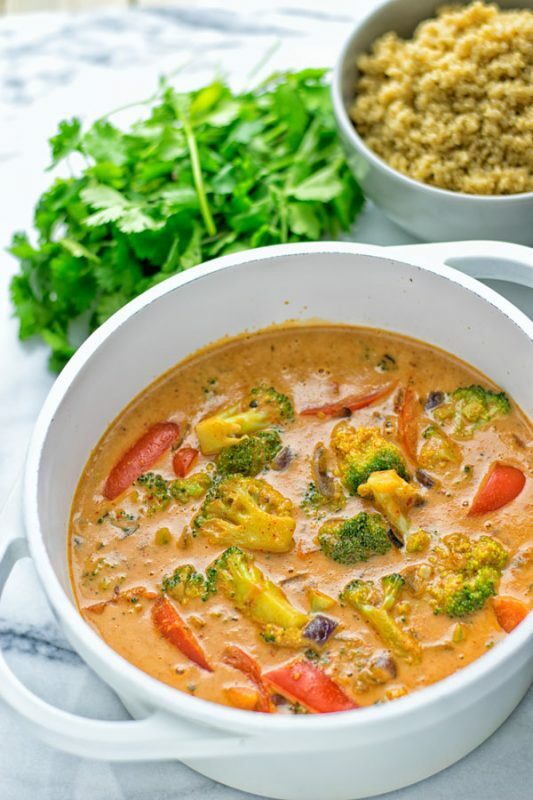 Finally add coconut milk, cashew butter, curry paste, and other optional ingredients of your choice. Now it’s time to cook for 6 minutes more. If you plan to use the tandoori cashews, it’s time to prepare them now. All you need is to mix the cashews with the spices (ginger, curry, turmeric, chili) and then roast all briefly in a pan. Serve directly from the pot, divide into bowls. 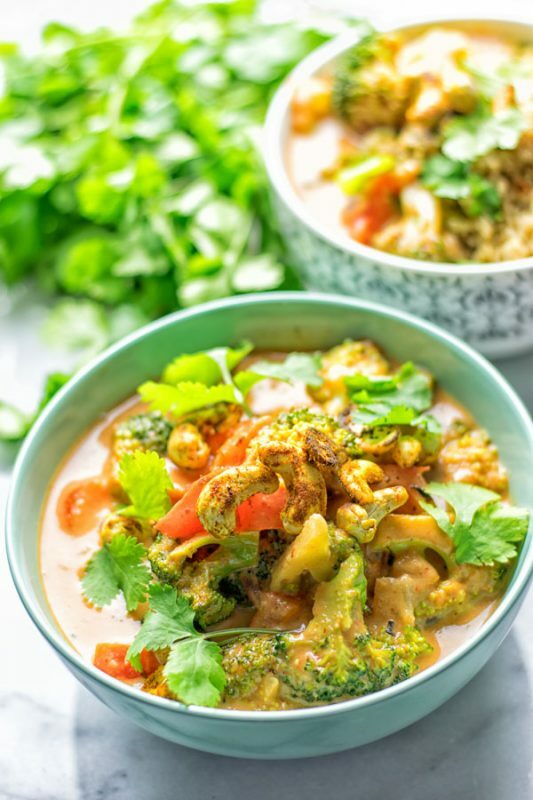 This Cashew Curry Broccoli Stir Fry makes an insanely good lunch or dinner. It’s a great dairy free alternative to meat or fish filled stir fries. You can serve it plain or make a full meal out of it by combining it with rice or quinoa on the side. I personally think there is no need for sides. It is just good as it is on its own. Also this stir fry makes an amazing work lunch. For real, no need to visit the fast food courts when you take a nice portion of this from home to work. It’s more delicious and cheaper to bring simple homemade food along. Plus, when reheating, this one’s flavors really start to pop big time. If you need more work lunch options to get you through the week, why don’t you take a look at my collection of 10 Best Easy Vegan Work Lunch Recipes? I’m always a curious mind and while I like getting my ingredients from the local organic store, I really began wondering recently how to make coconut milk? Turns out, it is not a big secret at all. All you need is unsweetened coconut shreds and water. Mind-blowingly simple. As a rule of thumb, you take double the amount of water than coconut shreds. I suggest you start with 1 cup of shreds and 2 cup water, and later you double the amount to 2 cups coconut shreds and 4 cups water. Now what’s left to do? Put everything in a blender, and process until what you get looks really smooth like nut milk. What you will have though is still small and tiny bits of coconut in the liquid. That’s not bad but really one doesn’t want these things in a milk. What you then have to use is a cheesecloth and press everything with your hands out into a mason jar so that you get as much milk out of this as you can. You really want to get a smooth and silky texture. This is of course the same for every other homemade nut milk. Did you know it’s so easy? A really easy to go for your coconut milk recipes. 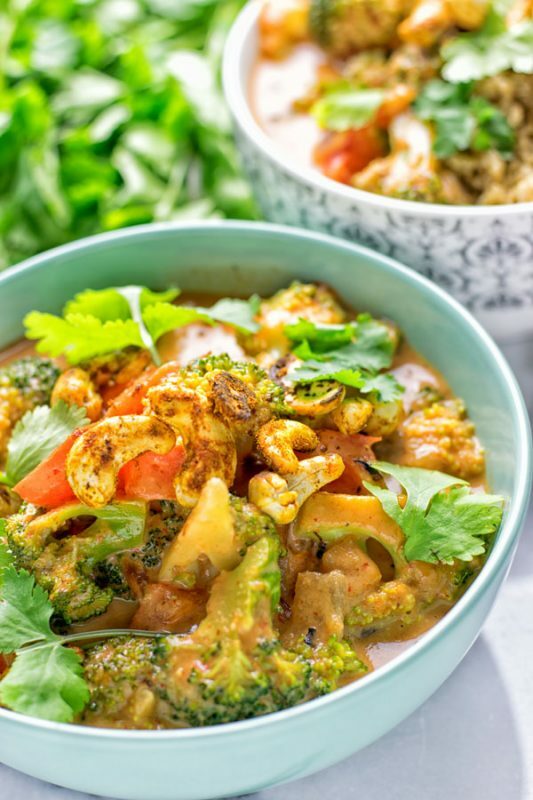 Give this Cashew Curry Broccoli Stir Fry a try, enjoy a big bowl. Tag me on Instagram and Facebook, say hello and let me know what you think. Give the broccoli florets to this mix and fry for an additional 5 minutes. Keep stirring so that the vegetables don’t burn and get fried uniformly. Reduce heat, if necessary. 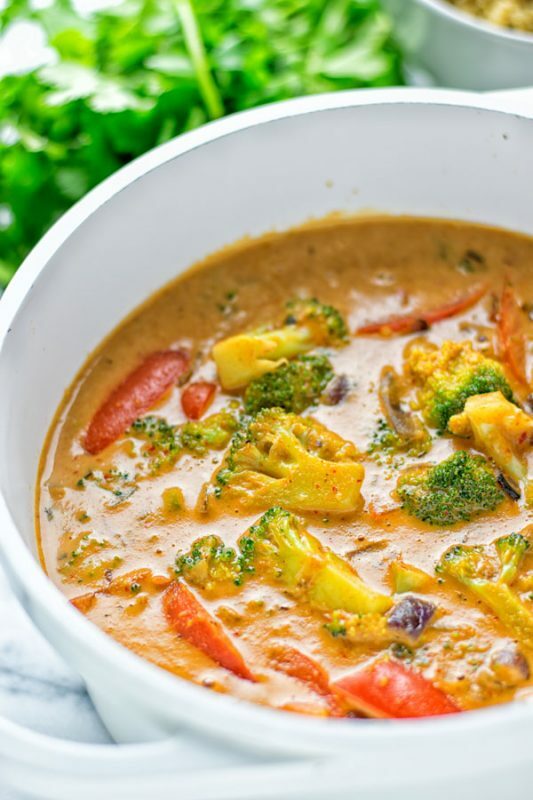 Finally add coconut milk, cashew butter, curry paste, and other optional ingredients of your choice. Now it’s time to cook for 6 minutes more. If you plan to use the tandoori cashews, it’s time to prepare them now. All you need is to mix the cashews with the spices (ginger, curry, turmeric, chili) and then roast all briefly in a pan. What curry paste did you use? Hi Megan! I used red curry paste! I assumed red curry because of the color but wanted to double check. Hi Megan! I used red curry paste, exactly! Hi Sarah! I used for the tandoori cashews: 1 tsp turmeric, 2 tsp chili powder, 3 tsp curry, 1 tsp, 1/4 tsp salt and 1/4 tsp pepper. Hi I’m curious do you mean dried desicated coconut that is sprinkled on laminating or do you mean shreds of coconut from fresh fruit? Hi Louise! I used canned coconut milk! Can peanut butter be used in place of cashew butter? Peanut butter will work, Shannon!